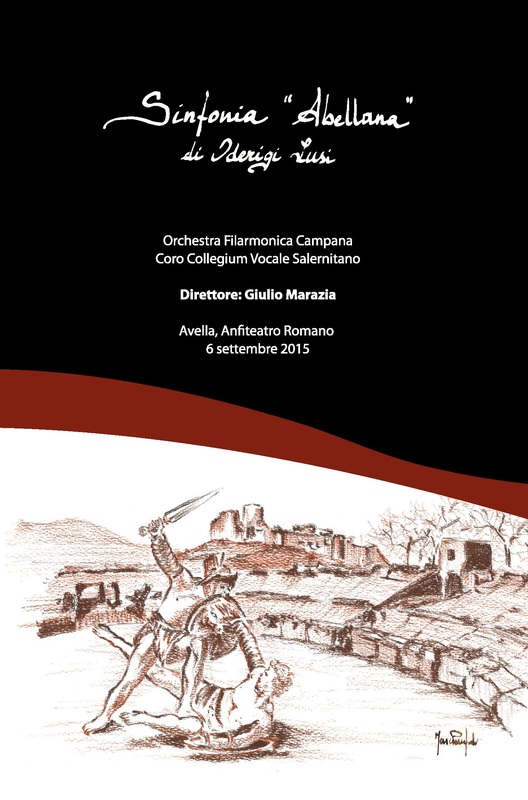 La monumentale Sinfonia “Abeliana” è un poema sinfonico in cinque parti per soli, coro e grande orchestra di ampio respiro che sviluppa musicalmente un’idea poetica, ispirata ai luoghi storici e le rovine dell’Anfiteatro Romano di Avella. Una composizione musicale che vuole evocare alcuni aspetti e momenti della vita avellana antica più volte decantata e conosciuta da Virgilio. Attraverso queste note, questi temi, di suggestione e ispirazione russa e francese del novecento, l’autore rende figurativamente momenti ed immagini trattando il materiale, a seconda di quello che descrive, con repentini cambi di registro, di timbro e di intensità sonora. È una derivazione diretta della musica a programma che fu una delle forme predilette dai musicisti romantici, ad esempio Hector Berlioz nella sua Sinfonia Fantastica e nell’Aroldo in Italia. L’intero percorso della Sinfonia è interpretabile come un grande periodo d’apprendistato teatrale e drammaturgico che Lusi ha iniziato con i precedenti lavori come “Notes from a Logbook”, la favola musicale “Il Nuvolo Innamorato” fino ad arrivare al melologo “Sul Sentiero degli Dei”, in cui il compositore mette a punto gli strumenti utili per il mondo prediletto dalla sua natura. La ricca immaginazione dell’autore arriva così a ricoprire d’immagini un torso sinfonico, che non è già autentico teatro musicale, ma solo la locandina di un dramma ancora da rappresentare. È facile seguire sulla partitura, con un occhio al programma poetico, la sequenza degli episodi: la debole pulsazione del battito cardiaco, il sogno di un antico sorriso, l’insorgere della crisi, la lotta contro la morte, il quietarsi del dolore, la visione dell’ideale trascendente. Il desiderio di dar vita con la musica a un repertorio d’immagini corrisponde alla ricerca di un’accelerazione della drammaturgia. Lo stile di Oderigi Lusi è sempre diretto anche in questo nuovo lavoro, riuscendo a modellare la scena in pochi essenziali quadri di rapida presa cercando con la tavolozza orchestrale e la ricercata condotta armonica, la plasticità immediata dei gesti e la contrapposizione sintetica delle situazioni. Numerosi come già detto prima i riferimenti ai russi Tchaikovsky e Schostakovitch e alle sonorità francesi che si rifanno a Ravel e Satie, ma molto presente è l’elemento ritmico continuamente ricercato e primario nello sviluppo e nella variazione tematica (vedi Stravinsky e Bartok). Marazia, Giulio (Conductor & Composer), He was active student of Maestro Gianluigi Gelmetti at the prestigious Accademia Musicale Chigiana in Siena, where in 2011, he won a major scholarship. As a conductor he was invited to festivals and concerts in Italy and abroad performing at the Teatro Mercadante in Naples, the Teatro Piccolo, Teatro Dal Verme, the Auditorium Cariplo and the Sala Verdi in Milan, the Teatro Uno of Rome, the Teatro dei Rozzi in Siena, the Auditorium Oscar Niemeyer in Ravello, the Roman amphitheater of Avella (Av) the Volkshaus in Jena (Germany) and the Opéra Royal de Wallonie in Liège (Belgium). In 2013 he was chosen by the Milan Conservatory to represent the institution at the “Premio Nazionale delle Arti” of Conducting organized by the Italian Ministry of Education, University and Research and held in L’Aquila at the local conservatory. He has directed several times in various concerts held in the Italian Wind Orchestras of Chieti, Gioia del Colle (Ba), Mercato San Severino (Sa) and Salerno. Musical and Artistic Director of Orchestra Sinfonica Ensemble Contemporaneo and Coro Collegium Vocale Salernitano from 2006 to 2013, At the head of these artistic forces, with a comprehensive and ambitious project, also he designed and produced annual music festivals, suggesting the spread and culture of classical music, symphony and opera live. For the “Valle del Sarno Pop Orchestra” has arranged, transcribed and directed the music for the concert event “Atom at night” dedicated to the major successes of Pink Floyd interpreted with symphony with over one hundred musicians involved. In 2014 he made his debut with the “Orchestra I Pomeriggi Musicali” of Milan as a guest conductor for a series of concerts. He inaugurates the academic year 2014-2015 with the opera “Don Pasquale” by Donizetti at the helm of the complex Choir and Orchestra of the Conservatory of Milan. From 2014 Assistant Conductor of the Teatro Verdi in Salerno, with the artistic direction of Maestro Daniel Oren. In the 2015 debut as Guest Conductor of “Metro Chamber Orchestra” in two concerts in New York, scheduled the Passion According to St. John of J. S. Bach, which has earned him the appointment by the 2015-2016 season of principal guest conductor. From 2015 Assistant Conductor of the Opera Royale de Wallonie in Liegi, with the artistic direction of Maestro Paolo Arrivabeni. He worked with leading orchestras throughout Europe including the Orchestra Giuseppe Verdi of Milan, the Sofia Festival Orchestra (Bulgaria), the Jena Philharmonic Orchestra (Germany) and the choir and orchestra of the Opera of Liège (Belgium). He is currently music and artistic director of the Orchestra Filarmonica Campana with whom he started a new phase, characterized by a growing national and international interest aroused by new productions, tours, recordings and audiovisual projects. These activities have projected the Filarmonica Campana in the global market, where today plays an important role in the promotion of Italian musical culture. He is a teacher of Music Education in Milan. Prizes: “Magnus Taburnus” for polyphonic Choirs (2007, conductor), “St. Alphonsus M. de Liguori” for sacred music (2009, composer with “Reflections”), “A lighthouse turned towards the future” for young people who have excelled in the field of labor, culture and art (2010), “Awards 2010” for the constant effort in the dissemination and promotion of musical culture in the area, “Premio Cavalierato Giovanile”, the best talent under thirty-five of southern Italy. Orchestra Filarmonica Campana was founded in 2006 in Pagani by Maestro Giulio Marazia, its current artistic and musical director. It is composed by both experienced musicians of prime importance and young neo-graduates and post-graduates from various Italian Music Conservatoirs. In addition to having established itself as one of the realities that can actually produce and promote music in the region, the OFC is increasingly able to attract excellent musicians, many of which combine their orchestral activity with a brilliant solo career, in chamber formations and education. After a ten-year path of continuous training and specialization, and more than 100 concerts, the OFC has been able to create a passionate professional group that has built a vast music repertoire that ranges from the Baroque period to the XXth century, from the great operatic repertoire to modern composers. The Orchestra’s main residence is set in the new Municipal Theatre S. Alfonso of Pagani but it also performs regularly at Teatro Diana of Nocera Inferiore and at the “Mario Ferrante” Concert Hall in the Circolo Unione of Pagani. The OFC was also invited to perform at the prestigious Auditorium Oscar Niemeyer in Ravello, in the charming park of the Certosa di Padula, at the impressive Roman amphitheater of Avella, at Teatro Eduardo De Filippo in Agropoli, and at “Villa Guariglia” in Vietri sul Mare on the Amalfi Coast. Oderigi Lusi: italian pianist e composer, ”who wisely links classic and contemporary music to World Music by exploring the sounds of the so-called “Souths of the World”. His style hinges on a rare piano artistry while his Neapolitan spirit magnifies the longing for freedom of all the Southern World people. In his music, the piano conveys emotions and feelings that music had forgotten to tell in such an elegant way for too long time”. Oderigi Lusi started studying music very young at “D. Cimarosa” State Conservatory in Avellino attending Composition and Piano Major. He completed his studies with honours. He performs both as a solo artist and in chamber music contexts and took part in several national and international competitions and festivals. He has been admitted (2008) at Berklee College of Music in Boston where he studied composition & film scoring developing the arrangement and the jazz language too. In April 2014 he won the Silver Medal at Global Music Awards in USA with the symphonic overture from his ballet “The Cloud in love”. In January 2012 he won in Rome, the National Composition Competition “Moderato Danzabile” dedicated to the composition of music for ballet. In the August of 2007 he took part to a course in Film Scoring at the prestigious Accademia Musicale Chigiana in Siena held by the Academy Award winner Luis E. Bacalov. In 2002 he won the first edition of the “Bruno Mazzotta” grant awarded every year to the best piano graduated from the “D.Cimarosa” Avellino State Conservatory and performed in occasion of the presentation of such grant in the Avellino State Conservatory Auditorium playing pieces by Liszt, Schumann and Brahms. He won several piano competitions. In 2000 he took part to two International Courses of Musical Interpretation and Perfection held by Maestro C. Lapegna. During such stages he performed at “Fondi Music Festival 3rd edition”, “Sperlonga Music Festival 1st edition” and “Concerti Itineranti” (Franciscan Convent Santa Caterina d’Alessandria, S.M. Valle Caudina – AV), making an impression by playing pieces by F. Liszt.